Even though online advertising has existed for 18 years, it’s still more about informing consumers than engaging them. Now, digital creative thinkers are striving to attain the magic of some of the most memorable campaigns from advertising’s early days. These classic ads had an uncanny ability to engage, excite, and elicit a real response from viewers. To help today’s digital visionaries reach similar levels of creativity, Google embarked on an experiment called Project Re:Brief, which consisted of choosing four of America’s favorite ads from the 1960’s and 1970’s and asking their legendary creators to use digital technology to reimagine them for the Web. The project supports the philosophy that to come up with great digital advertising, you first need to come up with great advertising. Google selected the most notable and nostalgic campaigns for Volvo, Coca-Cola, Alka-Seltzer, and Avis. 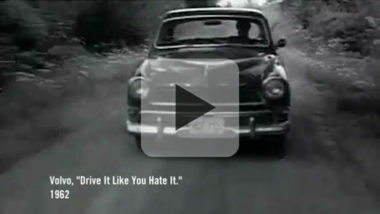 For the following reworking of the “Drive It Like You Hate It Campaign” from 1962, the Google team collaborated with Volvo and the ad’s original art director, Amil Gargano, to rework his classic ad with contemporary technology. In 1962, the Swedish-made Volvo was virtually unknown in the U.S. and desperately needed an identity and a message that would create distinction and desire among consumers. In developing the “Drive It Like You Hate It Campaign,” Mr. Gargano and his colleague, Carl Ally, wanted to make the car seem extremely tough and completely real. The result was a gritty TV commercial featuring a Volvo being brutally driven over rough terrain by a rally-car driver. It conveyed that Volvos were tough enough to withstand the harshest driving conditions and still perform at their peak. The ad made a huge impression on audiences and positioned Volvo as a strong and dependable automobile, while nearly tripling sales in only five years. After 50 years, Volvo has managed to retain that image of nonstop reliability and that classic commercial is still acclaimed by the ad industry as one of the greatest car campaigns of all time. For the reimagined digital version of the commercial, Mr. Gargano and the Google team found a way to tell a true personal Volvo story using today’s popular technologies. The ad focuses on an average man named Irv Gordon, yet his story is far from average, since he’s racked up a record-setting 2.9 million miles on his 1966 Volvo P1800 S. The ad invites viewers to follow Irv’s quest to reach the three-million-mile mark through a variety of video and audio content, as well as the use of real-time technologies such as social media and online maps. In addition, the way the viewer experiences the new online ad can be customized based on their viewing device and personal interests. While traditional ads had a beginning and an end, digital tools now allow viewers to continue following Irv’s story by interacting with him and receiving regular updates on his progress. So even after the ad is over, the story continues and welcomes viewers along for the ride. To see how Mr. Gargano and Google reworked the “Drive It Like You Hate It” campaign into an almost 50-year love story between a driver and his Volvo, check out this video presented by Google.